This itinerary outlines a tour through Argentina's more rugged landscapes, including Tierra Del Fuego and Patagonia. 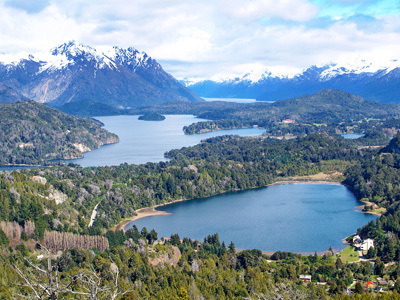 Argentina is a land of dramatic contrasts, and while some may travel here to enjoy the wine estates and the city life of Buenos Aires, this itinerary quickly dives into the epic landscapes that beg to be hiked through and explored by adventure-seekers. From Buenos Aires, you will travel to Patagonia, then to the glaciers of Tierra Del Fuego and finally to see Iguazu Falls, one of South America's natural wonders. This morning, you will be met by your guide to depart El Calafate, heading towards Perito Moreno Glacier, for a full day of unforgettable adventure! It is an 80 km long journey to the glacier, with time for plenty of stops along the way to take pictures. 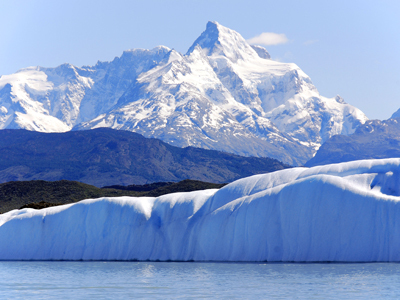 For the duration of the tour, a guide from “Los Glaciares” National Park will be with you, informing you about the surrounding area, the history and mysticism of this unique glacier. After entering the Andean Patagonian forest area, you will stop at “Curva de los Suspiros” (Sighs Curve), to marvel at the first panoramic view of the Perito Moreno Glacier. While trying to take it all in, continue your way to the platforms and balconies in front of the glacier, with free time to explore the various perspectives on your own. You will then board the Safari Nautico for a 30 to 40 minute boat ride. This will award you with an alternative view of the glacier (departing from “Bajo de las Sombras”). Marvel at the different perspective of the stunning walls of the glacier and the permanent detachments of blocks of ice. The blocks will later become icebergs, and as others float by very close to the boat, they provide a tinge in the reflection of the channels and lakes, to give it that peculiar blue they have always had. The craft, which offers room for up to 70 people, takes a prudential position, close enough to the wall, as to be able to cover its whole extension. Today, you will head to Estancia Cristina for another day of adventure! You will be met at the hotel this morning by your guide and transferred to Punta Bandera, which lies approximately 49 kms from town. Along the journey there, keep a lookout from the window of the spectacular views of the 9km-wide Upsala Glacier, the largest in the area. When you reach Punta Bandera, board a modern and comfortable boat to sail among icebergs. Admire the stunning scenery overlooking the western front of the Upsala Glacier, as you navigate along the northern channel of Argentino Lake. Once you reach the pier at Estancia Cristina (Cristina Ranch), you will disemebark the boat to continue your exploration from land. Hub Porteño is an 11-suite urban retreat, located in a former private mansion of Paris Stone, on a charming, leafy street of Buenos Aires. The hotel offers the atmosphere of a private home, with each room individually decorated using design pieces, handcrafted furniture and antiques, selected from the local auction houses. Featuring walk-in showers, jacuzzi baths and cut glass chandeliers, the bathrooms are some of the most luxurious in town. In addition to a trendy cocktail bar and two living rooms, you can relax on the rooftop terrace, lounge in the garden, or enjoy the gym and spa services, all within the heart of the city. Located in the Argentine Patagonia, the emblematic Llao Llao Hotel & Resort, Golf-Spa is a true ecologic paradise. Perched on a small hill within Nahuel Huapi National Park the hotel lays amidst limpid lakes, the majestic Andean peaks, and colorful larch and cypress forests. The resort has recently opened a new wing - Moreno Lake wing - featuring 43 deluxe studios and suites with air conditioning, jacuzzi, terrace, wide windows and panoramic views of the wonderful Patagonian landscape. Every space in the hotel is both beautiful and functional, creating the most unique blend of the highest standards, elegance and Patagonian majesty. Its exclusive services, the Conference and Convention rooms, Business Center, five top restaurants, 18-hole golf course, Lobby Bar, Spa and the two wings of the hotel - Ala Bustillo and Ala Lago Moreno – will make the Llao Llao Experience an unforgettable one. Built around a protected courtyard, Eolo is upscale through and through, yet casual and comfortable. Expansive cream-colored rooms have huge windows and a mixture of new and antique furnishings. Bathrooms feature refurbished mirrors, vanities, and deep tubs with windows looking out to the vast open landscape. No matter which way you look, there are sublime expanses outside with no trace of civilization in sight. Only 15 miles from El Calafate, and en route to the Perito Moreno Glacier, the property's location is convenient to town, the airport, and the main tourist attractions. Simply put, it's the perfect base from which to explore. The excellent restaurant on property is open to the public with reservations. Most people come here as an all-inclusive package that includes the traditional local glacier tours, as well as trekking, bird-watching and horseback riding. Of course, you may just want to lounge by the indoor heated pool as well. Loi Suites is a luxurious hotel set in the 600-hectare subtropical jungle of Iryapu, just 15 minutes from the Iguazu Falls. This beautiful property that was built with great respect for nature, preserving native trees and the surrounding jungle. 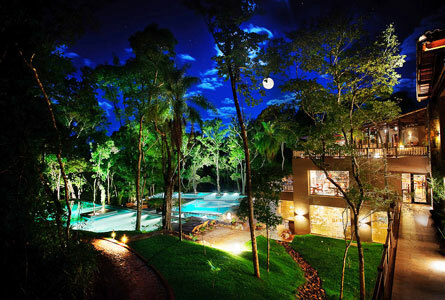 The hotel offers several features to make your stay in Iguazu as unique and memorable as possible. Some of these amenities include an exotic Tiki Bar, a large outdoor swimming pool and a scenic pier on the Iguazu River. Loi Suites boasts 154 guest rooms in 4 categories with a jungle view, and 8 exclusive "villas" that offer a view of Iguazu River.